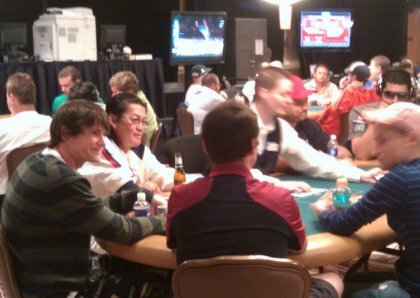 Last night, the 2012 WSOP Main Event played down to 9; the Nine players that will return October 28th to play down to one and the coveted bracelet. Eight of the October Nine are from the USA, and one player, Koroknai, is from Hungary. Youngest player is 21. Oldest is 56. Average age of players is 31 yrs. old. Largest stack is 43.9M. Smallest is 9.8M. Average stack is just about 22M. Sadly, neither of the women made it. There were two females, Gaelle Baumann and Elisabeth Hille, still vying for the final table when play was down to 18. Through Twitter, I saw that quite a few male and female spectators were rooting for at least one to make the final table – and Gaelle Baumann almost did. Her A 9 ran into Koroknai’s A J and neither improved. Gaelle had had a notable stack for several days. Interestingly, both women bubbled; Elisabeth went out in 11th and just missed the final table of 10 for last night’s play, and Gaelle went out right after to bring the number of players to 9 – and the October Nine were set. It was a quiet week last week as no events [that I could find] were streamed; not even the final table for the 2012 National Championship event. I saw tweets about players being moved to and from the “featured” table during the Main Event tournament; probably for TV, cuz’ I couldn’t find any featured tables with or without commentary being streamed. Congrats to Ryan Eriquezzo who won the National Championship tournament. It was fun to see that he had won because a few hours earlier at the dinner break when only 4 remained, he was the short stack with 764K. The chip leader had ~ 1.95M at dinner break, and, here’s a reminder of the chip stacks when the final 8 started the 2012 National Championship final table. 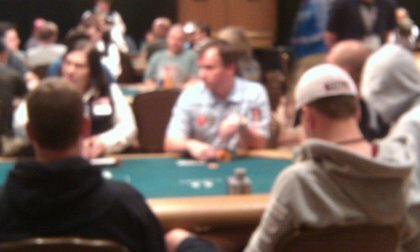 The 2012 Main Event played on. They are down to 27 and will reach 9 today/tonight – and we’ll have our October Nine or whatever they decided to call them. 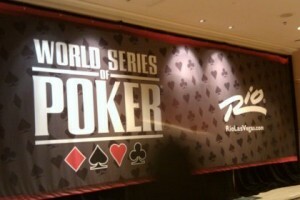 The final table for the 2012 WSOP National Championship tournament will be played out today starting at NOON Vegas time. No tournaments starting this week. The most prestigious no limit hold’em tournament in the world – the WSOP Main Event – starts at Noon today at the RIO All Suites Hotel in Las Vegas. Sitting at the poker tables last week, it was evident that the Main Event was on its way. Each night I played, there were more and more players from other countries. Conversation revealed that they had flown in for the Main Event. Indeed, they were practiced players with bankrolls. Tuesday night at one table we had 3 from USA, 1 from Belgium, 1 from Norway, 1 from England and the remaining from other countries which escape me now. 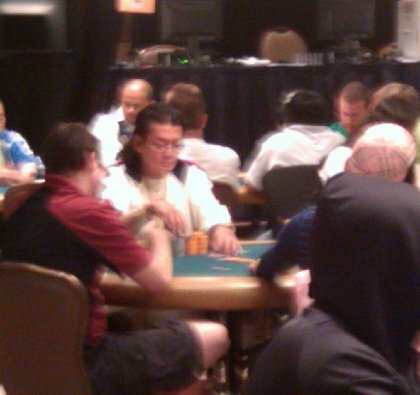 Thursday night at Planet Hollywood, Jamie Gold played at a $2/$5 table. He won a huge pot right off the bat – up to $700-$900 (table max was $300) in a single hand. He didn’t stay long… Last year while I was playing at the MGM, he did the same thing days before the start of the Main Event. My theory is that he comes out to practice with the masses to remind himself of how to play with the up-and-comers and wanna-be’s. Great pic that gets the nervous anxiety of anticipation going is over at the WSOP website , first snippet in The Daily Shuffle for Saturday by Nolan Dalla. 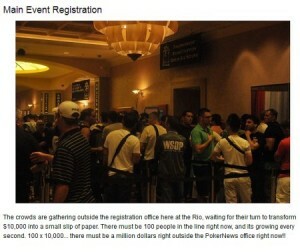 Another great pic of the registration line over at PokerNews.com in its All Mucked Up daily blog written by PokerNews staff. Went over to the RIO All Suites Hotel today to see what tournaments were being played and who was around. It was a blast to be there after the BIG ONE. It was much quieter, more easy to navigate, and easy to see. I ran into s player I had met on the plane and a women that I know from Massachusetts (and didn’t even know that she was in Las Vegas.) BUT – the fun part was seeing all the poker pros and up-and-comers. Antonio Esfandiari’s trip fives beat Sam Trickett’s missed diamond draw. That’s a wrap for The Big One in Las Vegas. Three other events are active now, including a $10K N0 Limit Hold’em tournament. About 5 -6 other tournaments are on deck! Hellmuth just jammed all in with A10s. Trickett called with AQh. Hellmuth was up on the flop that included a 10 and had 2 hearts. Turn was Kd. On the flop Trickett had 17 outs and made a straight when Jc completed the board. Rainbow flop with a K. Turn. River. Kings take it.